I was asked again to do the promotional materials for the Antioch Mayor's Prayer Breakfast, which takes place on the National Day of Prayer. And even though this design is not completely finalized, I wanted to share it! 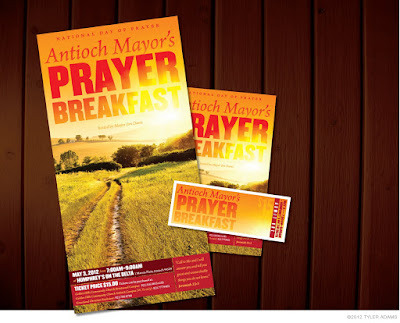 I really wanted the look of this year's materials to be very bright and cheerful, emphasizing the morning sunrise (since this is an early 7am prayer time for the community). I chose an image that I thought reflected the look of the Antioch area and tried to just let it speak for itself. This is an event open to the public through ticket sales, so I also designed the tickets to accompany the poster and flyer.